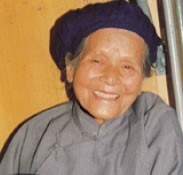 Although the Pinghua Chinese are counted as part of the Han nationality, their language is clearly distinct from all other varieties of Chinese. The Song Dynasty (960-1279): Zhao Kuangyin conquered more than a dozen regional kingdoms and assumed power in 959. The Song period is usually divided into the Northern Song (960-1126) ruled from Kaifeng City in Henan Province; and the Southern Song (1127-1279) which had Hangzhou in present-day Zhejiang as its capital. The northern state had fallen to Tibetan and Mongol kingdoms, who set up their own rule in the north, known as the Western Xia (1038-1227) and Jin (1115-1234) dynasties. The Song rulers were forced to relocate to Hangzhou. During this time, the world first learned about the mysteries and grandeur of China after explorers such as Marco Polo visited there. Historical records suggest chopsticks were not always used by the Chinese. In ancient times the Chinese used utensils similar to knives and forks, but after a prolonged period of famine, food was eaten in small pieces, and the use of chopsticks developed. The Chinese Book of History mentions that at the dawn of Chinese history in the days of Yao and Shuen, 2,200 BC, a terrible inundation was recorded that had once desolated the land. "In their vast extent the waters embrace the mountains and over-top the hills, threatening heaven with their floods." The Chinese have now reduced these accounts to merely a bad flood of the Yellow River. Guangxi, which means "vast west," has traditionally been one of the parts of China most neglected by missionaries. In the 1920s workers lamented that there were "areas inhabited by [minority] tribes where no Christian worker would be familiar with the languages spoken and where the country has not as yet been explored." Today a small percentage of Guangxi's 45 million inhabitants claim to be Christians. Protestants in Guangxi number between 50,000 and 90,000, in addition to 30,000 Catholics. View Han Chinese, Pinghua in all countries. 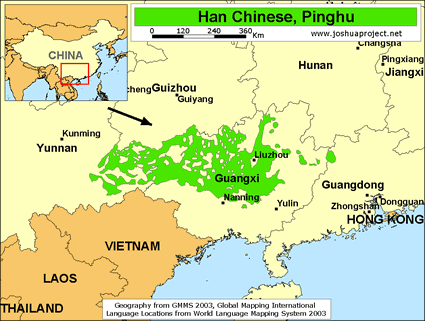 Location in Country: More than two million speakers of Pinghua Chinese inhabit the Guangxi Zhuang Autonomous Region in southern China. They live primarily along the major traffic routes between Lingchuan (north of Guilin) and Nanning in the south, especially those following the railway line. 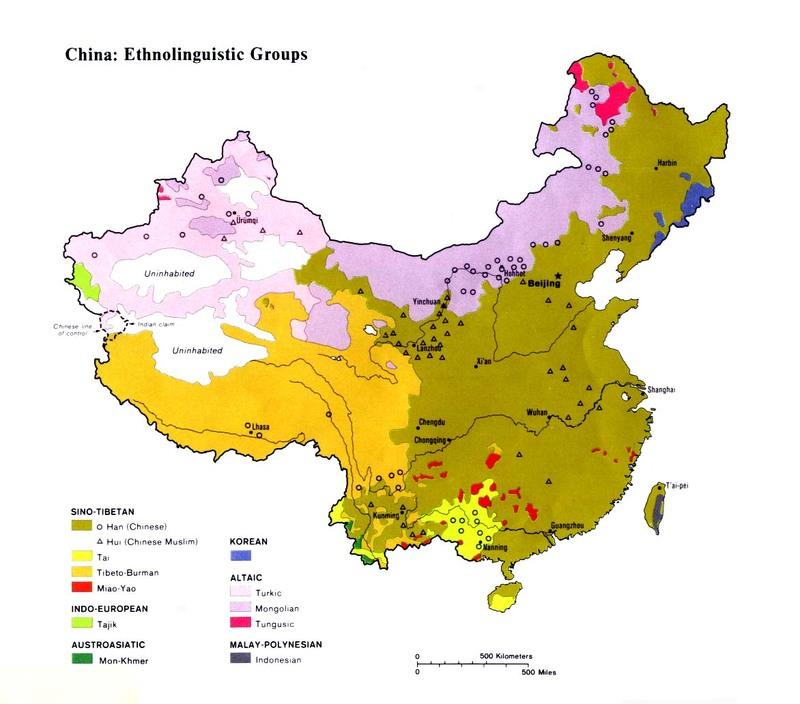 "A northern subgroup (Guibei) can be found extending from Guilin, through Yangshuo and Pingle, to Fuchuan, Zhongshan and Hexian."